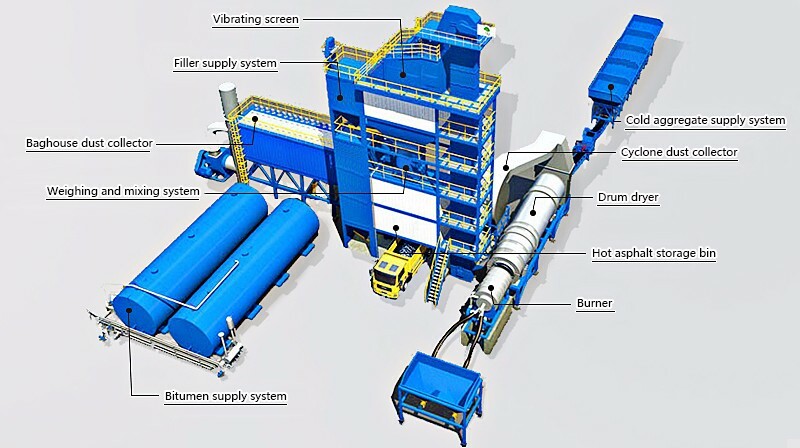 The eco-friendly asphalt mixing plant is mainly consisting of cold aggregate supply system, drying system (burner & drum), dust collection system (cyclone/volute casing collector as first stage, baghouse/water filter as second stage), hot aggregate elevator, mixing tower, filler supply system, and bitumen supply system. The main parts are imported brand like Simens. 1. Modular design, fast to install, convenient to transit, fast to move, reduce installation costs. 3. Equipment foundation is simple, it does not need to install cement concrete foundation,saving the cost and time of the site. 4. Most parts within the container are not affected by bad weather, so that the service life of the main unit and the parts is prolonged and the maintenance cost is saved. Company Introduction:Nanyang Liaoyuan Road Construction Machinery Co., Ltd (LYRM), established in 1992 with registered capital of RMB20 million, is a modern company specialized in manufacturing asphalt mixing plants. Our factory covers more than 60,000 square meters with output value amounting to RMB200 million each year. Currently we have 820 workers, including 200 technicians and 20 engineers.Our concept is to constantly strive for excellence, and continually improve our service. Strictly hold onto it, we have been awarded with many honors and certificates like ISO9001:2008, ISO14001:2004, CE and GOST.